The establishment of the Internet of Things, which has led to a downsizing of the PC architecture, has created new possibilities for finding solutions in the smart home segment, which should facilitate and expand everyday life. Smart home enhancements using Internet of Things techniques are designed to make smart home solutions even smarter. The terms Internet of Things and Smart Home are often used terms that are often confronted in the media. Often the smart home is referred to as the buzzword in the foreground, but underlying technology and the Internet of Things essay are not a despicable driver in the development of new smart home technologies. The focus of this article is on the interaction of the Internet of Things in relation to the smart home and addresses the question of how this interplay of the Internet of Things in the Smart Home adds value for consumers, industry and the economy and how the smart home market will change in the coming years. The Internet of Things (short: IoT) describes a ubiquitous information and communication infrastructure for services to and between virtual and physical objects. In the past, as well as today computer systems are actively used, the Internet of things should support the user in the future however largely independently in the hidden. The current technical progress makes it possible to equip almost all things with a computer system and thus to network. Until a few years ago computers and network devices were the devices that communicated with the Internet, but meanwhile also many everyday objects such as: garments, consumer goods, cars or electricity meters are able to independently communicate with each other or controlled via the Internet too become. This was made possible by the fact that processors can now be built as micro devices and microprocessors can communicate with each other by radio. They are virtually invisible to the human eye. Also, these devices are equipped with sensors so that they have the opportunity to perceive their environment and to send the collected information, prepared to central systems. As a result, the devices can independently go through small work processes and thereby become smart. Smart Home is the umbrella term for a privately used house or apartment in which tasks can be automated by means of networked sensors and actuators. This ranges from, for example, networked, programmable switches to heating controls and electrical appliances. This gives the user various added values ​​such as energy efficiency, safety enhancement, comfort increase and environment-supported life. By integrated or centralized logic, the devices can usually interact with each other and be remotely controlled. For example, actual values ​​are displayed to the user and the latter can adapt the setpoints accordingly or bring about a different action. The internal logic can be adjusted by algorithms according to the user’s wishes and depending on the system can be adjusted by an intelligence this independently. IP addresses (IP means Internet Protocol) are unique, assignable names for each device in a computer network. With the steadily growing number of network participants on the Internet, the IPv4 protocol is being gradually replaced by IPv6. Computationally, IPv4 can accommodate 2 32 = 256 4 = 4,294,967,296 subscribers and IPv6 2 128 (≈ 340 sextillion = 3.4 · 10 38 ) subscribers. As the Internet of Things continues to spread, IPv6 standardization and its implementation in the devices is an effective way to avoid address shortages. IPv6 over Low Power Wireless Personal Area Networks is a standard of the working group IETF and describes how IPv6 is used in the IEEE 802.15.4 standard. RFID stands for radio-frequency identification and describes a technology that uses radio waves to enable non-contact identification and localization of objects. At least the RFID tag reader is active and sends to the most passive RFID tags radio waves, which are converted in the chip by means of an induction loop to the required power supply. As a result, no separate power sources are required for the passive chips. Within the chips, the transmitted data can be received and processed and also return the result (for example their identification) via radio waves. This wireless communication can go several meters depending on the RFID technology used. Since the Internet of Things is still in its infancy, there are still no uniform standards. Two organizations are known endeavors to develop and establish standards. The AllSeen Alliance is a non-profit association of more than 200 companies and aims to create Internet of Things standards. The framework “AllJoyn”, which is currently being worked on, is an open source project that should allow smart home devices from different manufacturers to interact with each other. Open Interconnect Consortium (OIC) is also a non-profit organization with over 50 members working to develop standards for the Internet of Things. The OIC also relies on open source and currently sponsors the “iotivity” project of the Linux Foundation. For a smart home solution, on the one hand, networkable sensors and actuators are necessary (so-called smart home devices), which, for example, detect the room temperature (room temperature sensor) and increase the heating power if they fall below a certain value. On the other hand, a control center (so-called smart home systems), which receives the values ​​of the sensors, processes and controls the actuators accordingly. However, the smart home system can usually also be operated remotely in order to be able to control and adjust the target and actual values. For networking the smart home devices and the system, various options are available via cable as well as over the radio. With the integration of the Internet of Things, smart home centers are increasingly shifting to the cloud. There are also smart home systems, which try to combine as many standards as possible in order to be able to use providers and standards independently. The standards used in the smart home area are not exhaustive. IEEE 802.3 (Ethernet) is a standard for wired communication that runs protocols such as TCP/IP. The Wireless Local Area Network (WLAN) is a wireless-based standard that, like Ethernet, allows the use of advanced protocols only, that the transmission is wireless and allows a range of up to 100 meters. The Bluetooth standard is a wireless communication option that is very similar to the WLAN standard and was originally developed for use in small devices with low power consumption. 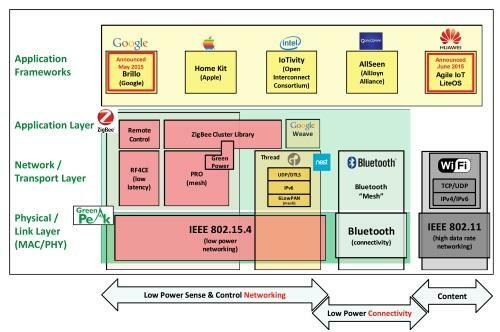 ZigBee is also a wireless-based standard based on the IEEE 802.15.4 standard, designed specifically to connect smart home components to the so-called ZigBee alliance. With the ZigBee 3.0 specification, this standard provides a direct interface to the Internet of Things. Like ZigBee, Z-Wave is a wireless standard developed by the Z-Wave Alliance specifically for networking smart home devices. A special feature is that a mesh network between the devices is built and each device thus increases the radio cell. The KNX standard is a further development of the European Installation Bus Standard (EIB) and describes the communication of sensors and actuators in building automation. Currently, according to own information over 400 manufacturers use this standard. With the extension KNX + both a radio and a wired communication of the participants is possible. Building Automation and Control Networks (BACnet) is a network protocol standardized by ISO 16484-5, ANSI and ASHRAE, with the aim of achieving interoperability in building automation in functional buildings. Besides the standards, the operating systems play a decisive role in the interaction and configuration of the Smart Items. In addition to industries typical representatives now also conquer manufacturers, which are not from the household electronics, the platform of the smart home and developing their own operating systems. With the presentation of “Project Brillo” at the in-house developer conference “Google I/O” in 2015, Google introduced a system based on a customized version of Android, which offers an interface with the Project Weave, which can also be used by other manufacturers for compatibility. At the Build 2015 developer conference, Microsoft introduced the “Windows 10 IoT Core” operating system, which runs on very small computers and gives developers the ability to develop programs for the Internet of Things. Smartphone maker Huawei introduced its three-part solution “Agile Network 3.0 Architecture” at its in-house Network Congress 2015 before, which contains the so-called LiteOS a very compact operating system. This operating system should be open source and thus bring developers to adapt it to their needs. Also, Apple introduced Home Kit. The merger of the Internet of Things with the Smart Home benefits both techniques, with the idea of ​​the Internet of Things becoming more and more integrated into the various aspects of the smart home. By example, a refrigerator that detects a certain underrun of a target value of food and automatically reordered or informs the owner of his smartphone, it becomes clear how the techniques interact with each other. The possibilities are almost limitless and the development of various algorithms, for example, to improve the quality of life, the users gain enormous value, the companies a USP (English unique selling proposition/unique feature), but also carry the misuse of the collected data. In the next part of this article, we will discuss devices in the smart home, applications and potential customers. This Article Has Been Shared 1141 Times! IEEE Standards Association has a number of standards Which Are Related to IoT. Here are IEEE Standards Related to Internet of Things (IoT). The devices in the smart home act independently, networked or both. Intelligence is intended to expand functions or introduce new functions into the already known devices, thus creating added value for the user. Cite this article as: Abhishek Ghosh, "Internet of Things in the Smart Home : Part I," in The Customize Windows, December 5, 2018, April 21, 2019, https://thecustomizewindows.com/2018/12/internet-of-things-in-the-smart-home-part-i/.